Museum of Power01621 843183work MuseumHoused in a former Water Pumping Station, the museum contains a fascinating collection of power-related exhibits that will interest the young and the not so young, with many working examples of various power sources, machinery, equipment and tools. 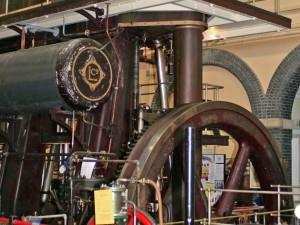 The most important exhibit is the 'Lilleshall' triple expansion steam pump which is now back on steam after 50 years. On non-event days there is a small charge for entry to the museum, however visitors can explore the seven acres of grounds and riverside walks for free. Visitors can climb the observation platform or choose from an extensive selection of refreshments and treats for every age in the relaxing Tea Room. Outside in the grounds, more attractions can be found including a model village, a picnic area and the ever-popular miniature railway providing rides at selective events. There is plenty to do and see for adults and children alike at the Museum of Power. In 2013 the museum was awarded “Engineering Heritage Listed Status” by the Institution of Mechanical Engineers. Housed in a former Water Pumping Station, the museum contains a fascinating collection of power-related exhibits that will interest the young and the not so young, with many working examples of various power sources, machinery, equipment and tools. The most important exhibit is the 'Lilleshall' triple expansion steam pump which is now back on steam after 50 years. Wednesdays to Sundays 10 a.m. – 4 p.m. with last entry to the Museum at 3 p.m. – tea room open until 4 p.m.
Open on Bank Holiday Mondays. Closed in January except for New Years Day. Last operating day this year is Sunday 18th December and we will reopen on Wednesday 1st February 2017. Details of prices for special events and Lilleshall Steam Days are as shown on the Events page. Please note there are reductions for groups of ten or more. In addition evening group visits can be arranged available subject to minimum charge of £50. Please contact the Museum Manager for details. On non-event days entrance to the grounds and tearoom is FREE, however a Museum entry charge applies as shown above. On days when the miniature railway is running additional charges apply for rides, currently £1 per train ride or six rides for £5.